If you live in Edmond, Oklahoma, you can attend an exhibition of nearly three dozen artifacts from the period of the first temple, discovered by Dr. Eilat Mazar. On January 15th, the Armstrong Auditorium is going to be showcasing these artifacts, with a concert given by pianist Orli Shaham and violinist Itamar Zorman. The two pieces of which they are most proud are bullae that were discovered in 2005 and 2008, both bearing names of princes who are mentioned in Jeremiah 38:1 – Gedaliahu ben Paschur (in the foreground) and Yehukal ben Shlemaiah (in the background). It’s always exciting to see artifacts that relate to material that we read in the biblical literature, but it’s also always entertaining to witness people getting carried away with their significance. Take, for example, Stephen Flurry. He is the executive editor of The Trumpet, which is a publication by the Philadelphia Church of God, but is also the president of the Herbert W. Armstrong College in Edmonton, which has been funding Dr Mazar’s excavation. His reaction to the bullae, while slightly more circumspect in 2008, was to declare that “we are honored to be involved in Dr. Mazar’s work. 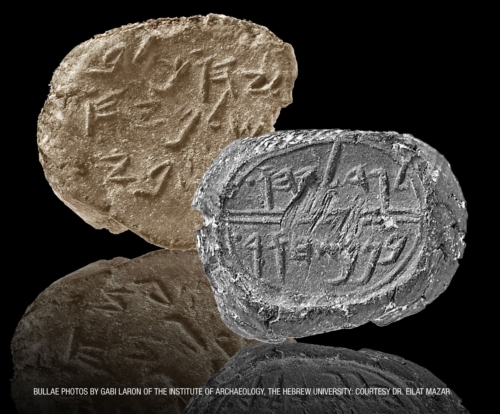 These tiny artifacts validate Jeremiah’s account and provide overwhelming proof of the accuracy of the biblical record.” [link] Overwhelming proof indeed! In fact, if you look at the bullae very closely, you might be able to make out the fine print that can only be seen by those of us who are truly pious, in which the coins refer to the tossing of Jeremiah into a well. You can’t see it? Pray harder. They’re right about one thing. That really does set them apart from other news sources.